After the -prompt- French official declaration of yesterday, supporting the AU and the government, I was left wondering: “so what?” Of course what has been achieved must be protected. However, it looks to me that once again, as we have often seen now, there are discrepancies between what the IC’s truth and the Malagasy reality. 1 – What have the UA and their backers really achieved? 2 – What does a reconciliation entail? 3 – What do Malagasy want? 4 – What do UA and their backers want? I understand part of the IC is embarrassed because here is a man who has been waiting for their good will for 6 years or so, a man some have believed they have made people forget, a man they believed was playing golf somewhere in the South of Johannesburg, has now appeared like a messiah before the Malagasy people. His biggest fault is to unveil others’ shortfalls. Hiding behind a “he didn’t tell us” is not really mature. On “he is not trustworthy; he lied that SADC and few countries back him?” Think again; there were promisses made; maybe not in 2014 but before then, certainly. And on “destabilizing declarations”, he really said: “I’m not going to wait for 2018”. Most interpreted it as: “not wait for 2018 to seize power”. Guys: you’re losing your cool. The man is closer to an admirable genius than a stupid man. Work with him! Make it “I’m not going to wait for 2018 …before I start contributing to the reconstruction of the country”! He is fully capable of doing that, more than anyone. Very few believed he could fly back on his own. Just believe; he is more than capable of mobilizing many Malagasy to reconstruct what has been destroyed. Let him work, he will let you harvest the honor of his work. All will be happy! Or rather, there are going to be many more happy people than unhappy people; after all, that is democracy. Shocking declarations of the international community via the SADC and France following the arrest of ex-president Ravalomanana, or Dada which rubber stamped the Government’s arbitrary decision on the basis of unclear legal grounds is already in the past. SADC and France condemned Dada’s speech upon his arrival and merely hinted at the possibility of a national reconciliation. Both seemed to have given the Government a green card to what has now become an illegal arrest. The exception was the USA. They wisely chose to stay silent on the issue of arrest and instead reminded Madagascar to seriously consider a move towards national reconciliation. Just two days ago, admist confusing reports of whether Dada incited violence through his speech during his arrival and whether he was under surveillance on the basis of security threats or simply locked up; France and the SADC did not condemn the violation of Ravalomanana’s rights. However, after following the development of the events, the SADC urged the Government to respect the rights of Dada and hinted at a potential violations of such rights. Dada is moving closer to becoming a symbolic martyr for his followers: unjustly locked up for the World to see, victim of the decision of a suggestive authoritarian regime. Slowly rising from the status of Dada or father to a martyr, Ravalomanana’s detention situation seemed to have worsened. The ex-president of Madagascar is reported captive in a Bana naval base in Diego Suarez, North of the country. His wife Lalao Ravalomanana called out for help, and shared her concerns with her followers denouncing injustice and mistreatment of her husband. She reports that he is being held in one bedroom, denied time for fresh air or family visits. This only confirms that he is in fact arbitrarily arrested. Held captive without any legal basis. Hearing the concerned appeal of his wife and family members: are we possibly moving toward mistreatment ? Or is that paranoid thinking? Certainly, the Government needs to do some damage control. The current President Rajaonarimampianina is unknown for such miscalculated moves. He is a skilled and knowledgeable leader, who surely would have assessed and acted within reason. In contrast, his spokesperson and advisors, such as the trained lawyer Rabary Njaka, surely lacks integrity and credibility. A proof of which, was his declaration that: “everyone is entitled to their opinions” in relation to the measures taken. When in fact Ravalomanana’s situation should no longer a subject of debate: he has been arbitrarily arrested, illegally detained and potentially mistreated. Sir Rabary Njaka, please check your legislations. Finally clearer on the events and in hindsight, the International Community correctly urges Ravalomanana’s rapid and effective release. Will Dada be a free man again, soon enough? 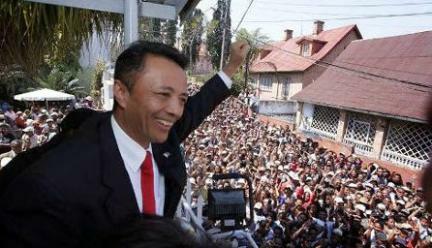 Former president Marc Ravalomanana finally stepped on the Malagasy territory, his homeland on sunday 12th october in the night. A land where his followers call him: Dada, or father. Where he was once democratically elected as Chief of State then thrown out of power by a controversial coup d’état in 2009. A transition government was put in place reigning over the not so glorious years of political instability. This time around, Dada successfully entered the Malagasy territory without the typically mediatised declaration of his arrival. Surprising many of his followers – Dada is back ! Dada’s arrival was followed by predictable controversies. The current President Rajaonarimampianina announced that he has been arrested, emphasis added, to ensure his safety. Dada has actually been placed “in a supervised area” to ensure his safety. Clearly he has been invisibly hand cuffed and imprisoned by the authorities in a naval base in the North of the island in Diego Suarez. None of the Government officials hierarchically competent to decide on such matter was present at the conseil de gouvernement that was to decide on Dada’s fate. General Dominique Rakotozafy, minister of Défence, Didier Gérard Paza, secretary to the gendarmerie nationale, as well as the minister of “public security” who would be the principal decision maker on such issues were not involved the meeting. Once again, the lack of transparency on defining events in Madagascar’s political future is not surprising. Where should we start? A shady house arrest, that was not decided by a tribunal, without a warrant, I presume, thus devoid of any legal basis. It was in fact a decision taken by the conseil de gouvernement, thus by the executive branch. Should we call it a “kidnapping” or an “arbitrary arrest”? Thus in violation of the rights of a former Chief of State, a legislation upheld in Madagascar as well as articles 5 and 9 of the Universal Declaration of Human Rights which was ratified and implemented by the Malagasy Government. 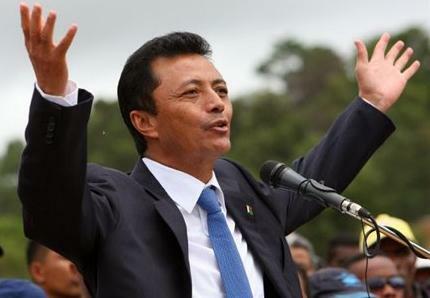 If Ravalomanana, was a danger to another person, to the population, to national security, similar measure emanating from the legislative branch could potentially apply. However, as President Rajaonarimampianina declared, he had been locked away in Diego on the basis of security threats. In the legislation on the rights of former Chief of State, it is possible to assign military type of surveillance if such threat is suspect and there are reasonable grounds that Dada was indeed in danger. Needless to say, it is only a matter of the most simple research to conclude that Dada under house arrest was an arbitrary decision. The government of Rajaonarimampianina should calculate his actions carefully since such blatant abuse of Dada’s right is unacceptable even when rubber stamped by the SADC and FRANCE, who in fact congratulated him on obvious violations.